Randy Stevens of E-Z Drill advises how to choose the right concrete dowel drill for public works projects. Editor’s note: Randy Stevens of E-Z Drill, Inc. advises how to choose the right concrete dowel drill for public works projects. 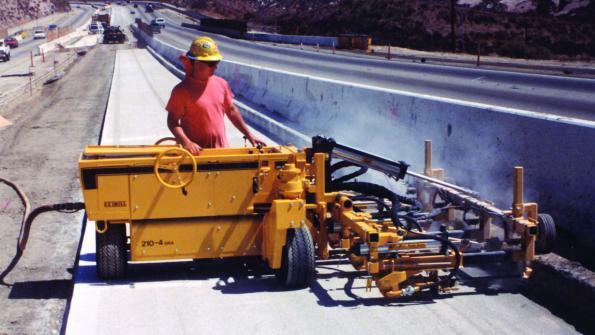 When choosing a concrete dowel drill for government road repair projects, work crews need to hammer into the details. Project conditions, scope and deadlines all come into play. Three types of drills are the most common: on-grade, which sits on the subgrade; slab-rider, which works from the slab rather than the subgrade; and equipment-mounted, which also works on the slab but is attached to the backhoe or excavator. If there are only a few inches of slab exposed, an on-grade drill is your only option. On-grade drills are lightweight, which makes them a great choice for projects where you will need to move frequently. However, they are often equipped with just one or two gangs, so they might not be an efficient option for large projects that cover greater distances. Slab riders can deliver greater efficiency on large, long-distance projects like lane additions. They also can provide greater precision because they reference from the top of the slab, which is more level than the subgrade. In the photo at left, a slab rider drill from E-Z Drill. On larger, full-depth repair projects that consist of multiple intermittent patches spanning several hundred feet, an equipment-mounted drill might be the best choice. The operator simply lifts the drill with the backhoe or excavator and drives to the next patch. After you have the right drill type, you have to decide on the number of gangs. Single-gang drills are typically ideal for jobs that require several hundred to a few thousand holes, while two-gang drills are better for 5,000 to 10,000 holes. As the number of holes needed increases, so can the number of drills on a machine. Whether it’s on-grade, slab rider or equipment-mounted, matching the right drill with the project takes more than knowing the surface information. To be sure your equipment choice positively impacts your efficiency, accuracy and productivity, drill into the details. Randy Stevens, the vice president of sales at E-Z Drill, has been with the company for more than 20 years. He has served on various committees of the Association of Equipment Manufacturers and is a member of the American Concrete Pavement Association. E-Z Drill is based in Perry, Okla. In the video, Randy Stevens of E-Z Drill offers tips on operating an E-Z Drill product.